A Hamilton County poll worker who has been held up nationally as an example of voter fraud took the stage at a local voting rights rally – outraging Republicans and dismaying even top local Democrats. The Rev. 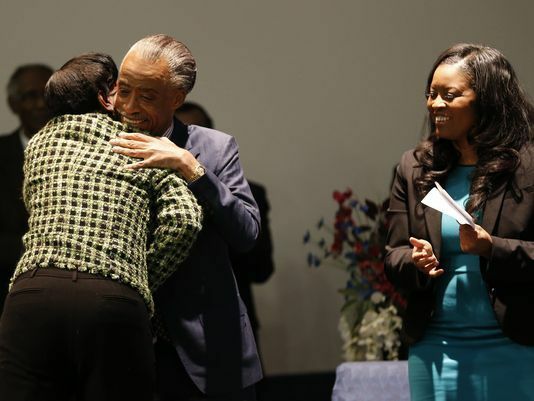 Al Sharpton, keynote speaker at Thursday's rally to kick-off the campaign for an Ohio Voters' Bill of Rights Ohio Constitutional amendment, even hugged Melowese Richardson. Richardson, a Democrat, was convicted of voter fraud after using her position as poll worker to vote more than once in the 2012 presidential election. She got a five year prison term, but was released earlier this month after local Democratic activists pressed for a fairer term. A judge sentenced her to probation instead. Associating with a known felon is not a violation of probation? That's a lot of stupid to fit in one room. Quote: . . . . . .
Richardson was previously convicted of threatening to kill a witness in a criminal case against her brother; of stealing; of drunken driving; and of beating someone in a bar fight, according to past Enquirer stories. They didn't think this rally through too well. Lots of opps to spin this one, and it looks like it did. With all those other criminal activities in her past, how the hell did she get to be a poll worker? Has she been working some other poles? It's very easy to visualize a massive fraud campaign with everything that's been going on. The right to legitimately choose our political representatives is our most sacred one. In my opinion, voter fraud should be publishable by death. Ten*K;138848 Wrote: With all those other criminal activities in her past, how the hell did she get to be a poll worker? Has she been working some other poles? It's very easy to visualize a massive fraud campaign with everything that's been going on. What scares me just as much is she got caught. How many poll workers in this country didn't? Philadelphia Patriot;138851 Wrote: What scares me just as much is she got caught. How many poll workers in this country didn't? Well, suggestions that this was not an isolated incident have historically been met with the usual 'tin foil hat' accusations, but I don't doubt that she is the tip of the iceberg. 15 min tape of Richardson's sentencing. 8:45 he talks about voter fraud like her's being like an insect infestation.